This past memorial day (May 31), we had opportunity to travel this route on our way from MI to visit my son, who at the time was stationed at the US Army School of Music in Norfolk VA. We spent the night at a small private campground in Somerset, and then drove from there to Norfolk. This 2.5 hours of the drive was by far the most engaging and beautiful of the trip. Endless curves and massive elevation changes the whole way. When you switch from map view to satellite view, you can see why. The first part of this descending out of the PA mountains is a lot of fun downhill curves, then it flattens out a bit coming down into the George's Creek valley. The 36-to-51 route thru Cumberland takes you thru a natural gap in the foothills, and Cumberland is an interesting old rail town with lots of possibilities for food and lodging, although we didn't stop for either. Once you cross into WV and start heading south from Paw Paw, the route has tons of elevation changes to go along with the twisties...up and down, back and forth...make sure none of your passengers suffer from motion sickness!!! Be careful coming into VA, we saw TONS of cops in VA, after seeing none in the previous 3 states. But a really fun drive the whole way, and you end up in Winchester where you can visit some nice local wineries, or even pay a visit to our very own BC Blase! Unfortunately, we were pulling a camper, so I didn't get to enjoy this drive the way it was meant to be driven...in a PORSCHE...but it was still awesome. 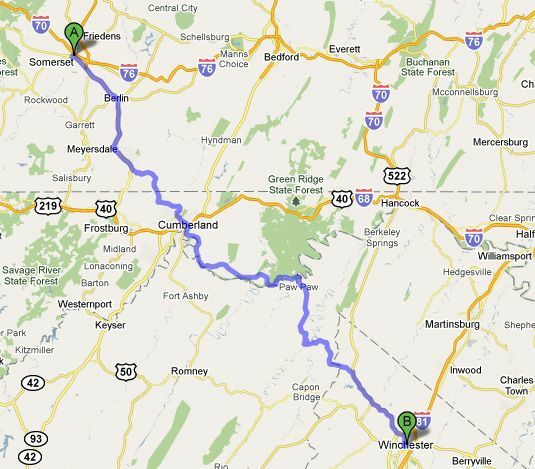 This part of PA-MD-WV has got to have some of the best twisties and scenery east of the Mississippi. 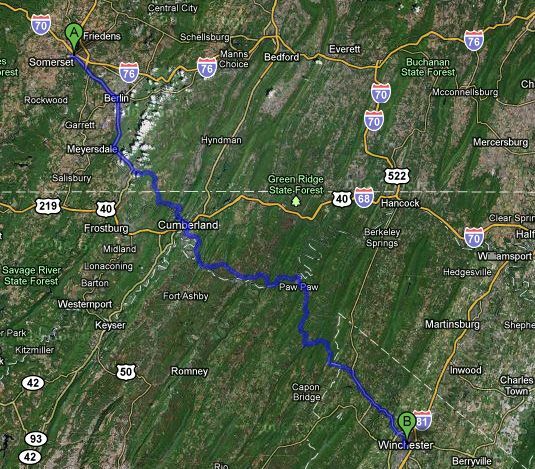 I drove from Capon Springs to Bedford Pa this spring and I agree, great drive, beautiful country. After I did this trip, I was back in the area about a year later and drove more of the Lincoln Highway, which takes you right past where Flight 93 went down. Very beautiful country. Didn't have time to go to the memorial, but it's on my to-do list. As Dan knows, Rt 30 Bedford - Chuck's cabin. He missed the hat trick this year.